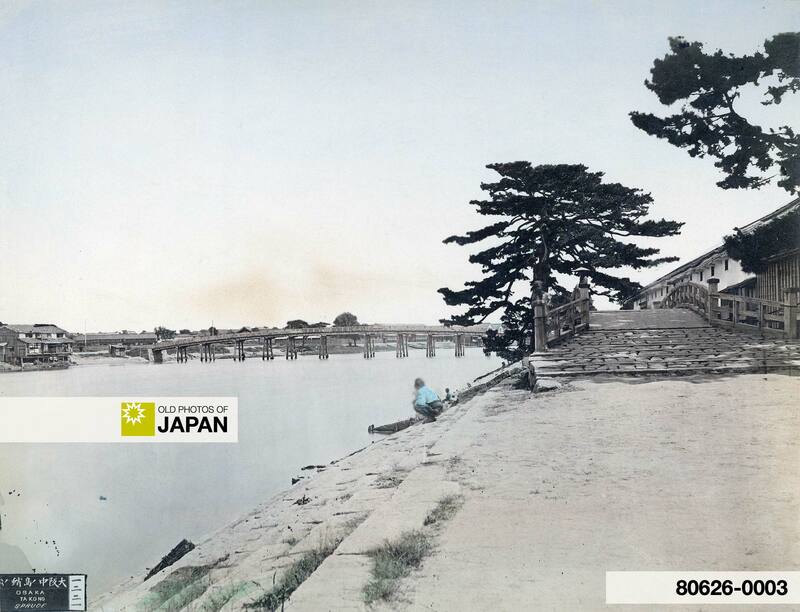 This very rare image shows the Tako no Matsu (鮹之松, Octopus Pine) on Osaka’s Nakanoshima. This pine tree was located in front of a kurayashiki (蔵屋敷, a combined warehouse and residence) of the daimyo (lord) of Kurume (久留米), a town in Fukuoka Prefecture. During the Edo Period (1603-1868), the banks of Nakanoshima were lined with many kurayashiki of daimyo who brought their domain‘s rice and other products to Osaka for sale. 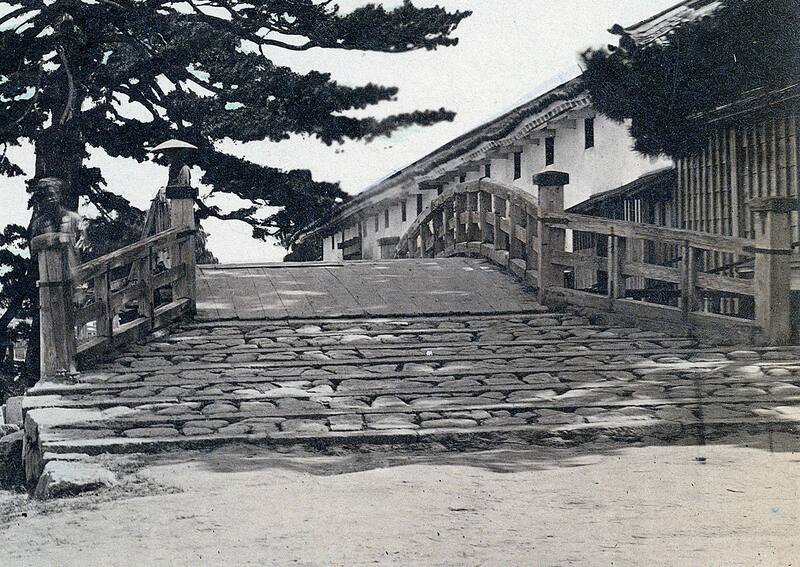 The daimyo would also rest here on their way to Edo (current Tokyo). The Shogunate‘s requirement that daimyo spent alternate years in the capital (Sankin Kotai), meant that daimyo ended up traveling a lot, so the kurayashiki was far more than merely a branch office. Detail showing houses near the Tamino Bridge. Notice the cat enjoying the view from the roof. 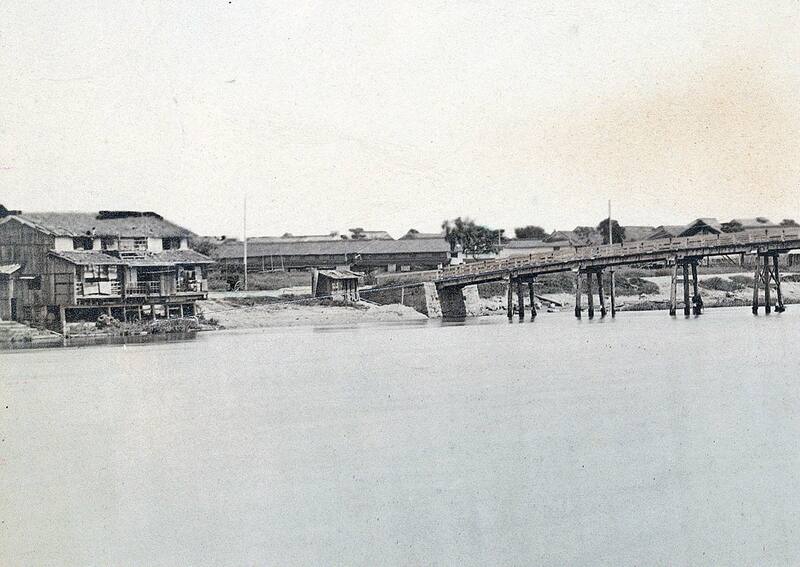 Kurume Bridge. The long exposure has reduced the person on the left to a ghost-like image. The man standing on the middle of the bridge clearly didn’t move much. 1 蛸の松. Retrieved on 2009-01-11. 3 Yomiuri Shimbun Shakaibu (1987). Scenes of Naniwa: Osaka Time Tunnel. Warajiya Publishing Co., Ltd, 8-10. 4 The same image is also part of the Teijiro Ueda Collection, the only other print of this image that I am aware of. You can also licence this image online: 80626-0003 @ MeijiShowa.com.